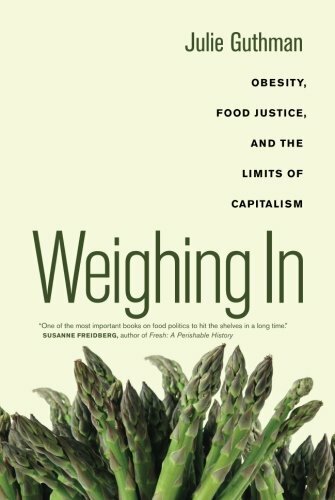 Weighing In takes at the obesity epidemic,” challenging many widely held assumptions about its causes and consequences. 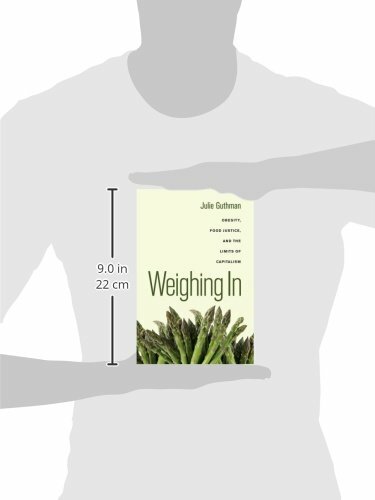 Julie Guthman examines fatness and its relationship to health outcomes to ask if our efforts to prevent obesity” are sensible, efficacious, or ethical. 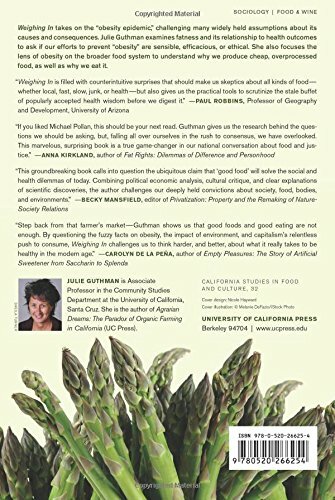 She also focuses the lens of obesity at the broader food system to take note why we produce cheap, over-processed food, in addition to why we eat it. Guthman takes issue with the currently touted treatment to obesitypromoting food that may be local, organic, and farm fresh. Whilst such fare could also be tastier and grown in more ecologically sustainable ways, this approach can also improve class and race inequalities and neglect other imaginable explanations for the upward thrust in obesity, including environmental toxins. Arguing that ours is a political economy of bulimiaone that promotes consumption Whilst also insisting upon thinnessGuthman offers a complex analysis of our entire economic system.